Is the Text Ad Dead? Is the text ad dead? In a word, no. Text ads—ads that use only words within specific length and sizing requirements—still appear in search engine results and on websites, and sometimes even social media as well. Text ads are simple in format and content (no graphic designer required). At one point in the not-too-distant digital past, they were pervasive on the Internet, too. But text-based advertising certainly appears now to be fading off in the digital marketing horizon. This is due to the rise of native advertising in various forms and formats. Open an app on your phone lately? Native ads are everywhere. You just may not have recognized them as such. Native advertising, also sometimes known as ‘sponsored content’ or ‘promoted stories’, is advertising that tries not to appear like advertising. It blends in with the other content and layout around it, in order to be as non-disruptive for the reader as possible. 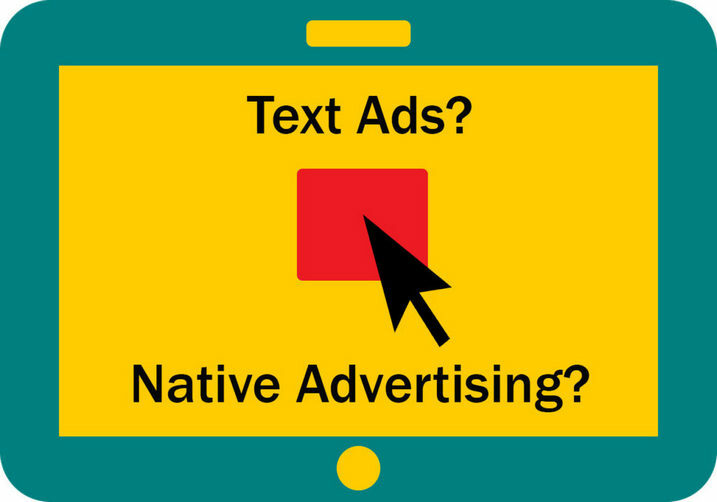 Native ads can appear in a variety of platforms, including websites, mobile apps, and social media. They can also take different forms, such as articles, videos, infographics, and the like. It would seem that native ads are the way to go and would overshadow any other forms of simpler advertising. Native ads, however, require a lot more work, in terms of design and content. While text ads do require some degree of careful and considered content creation, in general, they’re easier to write, implement, and manage. Native advertising is different. It requires creative implementation of a company’s branding, while maintaining the editorial tone and look and feel of the host site or application. Also, copywriters need to craft native ad content thoughtfully. Some examples include: how-to or tips and tricks articles, quizzes, or informational videos. Transparency with respect to native advertising is also important. Companies risk criticism or alienation if their native ads appear misleading and aren’t clearly defined as ads. With calls of ‘fake news’ increasing, consumers are primed for detecting deception. Thus, they have little patience for deceptive or ambiguous advertising. Arguably, it’s relatively easy to spot text ads. On the other hand, it is increasingly difficult to pinpoint native ads (depending on implementation). Savvy Internet users will be familiar with both forms of advertising, easily spotting (when clearly labeled) the ‘sponsored content’ on native ads. In fact, even the comparatively simple text ad is a form of native advertising, when found at the top and bottom of search engine results—they look like search results and they sound like search results (but for the wee little “AD” tag accompanying them). Both Google and Bing search engines are phasing out more ‘obvious’ placement of text ads in the sidebar of search results pages. So, is the text ad dead? No—not quite. But like the rest of the Internet and technology in general, both text ads and native ads are quickly evolving to adjust to an increasingly shrewd and discerning audience, expecting advertising that looks less like advertising and more like something useful, non-disruptive, and transparent.